Just How Big is WordPress Exactly? What got us here isn’t going to get us there. Once we get to 50%, we can decide something new we want to do. Right now, WordPress claims a 24% share. We decided to dig through the statistics to try and find out a bit more about where they come from, what they really mean and how WordPress may need to adapt to hit its target – and if such a seemingly ambitious target is reasonable. Of course, one must bear in mind the scale of the web: 24% market share is huge. As I began writing this post, WordPress 4.2 (the latest version) had been downloaded 48,258,660 times. In just the time until I finished it, that figure had risen to 48,282,215 (23.5k downloads). So, now, the results of my research – beginning with what exactly makes up that 24% figure and what it means for WordPress. The figure of 24% (or 24.2%, more precisely) comes from W3Techs’ analysis. Of the websites they monitor, a quarter of all of them use WordPress CMS. Obviously, not all websites use a CMS – in fact, 58.6% of the websites W3Techs analyzed aren’t using a CMS that they monitor for. There is a caveat here – they may not be able to detect it if the website has hidden it or if the CMS is especially obscure or bespoke. Since that’s not the case for most websites, the figure provided by W3Techs can by-and-large be taken as representative. Out of the remaining 41.3% that do use a content management system, the figure of 58.6% (entirely coincidentally) resurfaces. 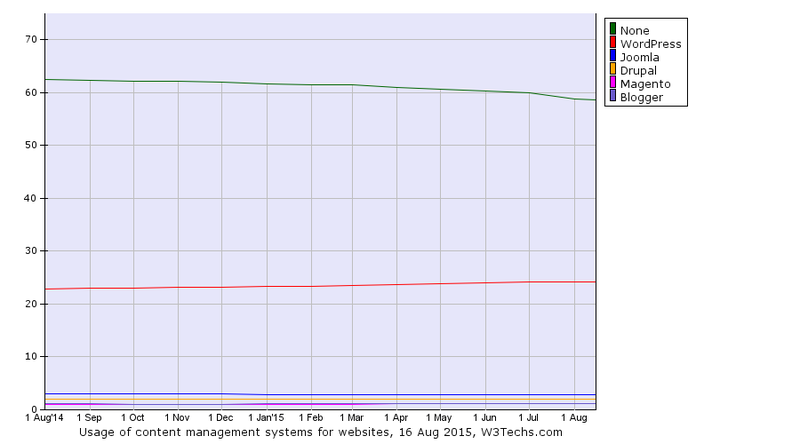 So, in terms of market share among websites that already use a CMS, WordPress has already surpassed the halfway mark. That becomes the case even more if you consider each separate WordPress.com website as an installation, which W3Techs largely don’t – they’ll only count a WordPress.com website as a separate WordPress website if it has its own URL, rather than a *.wordpress.com one. Considering the next most popular CMS by W3Techs’ metrics makes the statistics for WordPress yet more impressive. While not insignificant, Joomla’s 2.8% of the web (as opposed to WordPress at 24.2%) rather pales in comparison – and while WordPress’ use is booming, Joomla’s is declining. In this light, WordPress’ (and also Automattic’s) influence over such huge portions of the web – particularly the sections that publish – is extensive to say the least. The figures W3Techs has compiled are, naturally, not a complete reflection of the web. Even Google can’t know about every single website out there (as hard as it might try). W3Techs actually looks only at the top ten million Alexa-ranked websites on the web. That’s likely to discount quite a lot of WordPress-powered blogs (even active ones) and other websites, so while being a measure obviously designed to make statistical analysis practical, there’s no guarantee that it’s a representative sample of the web. Nevertheless, it does give the best reflection we can really hope to get. Who Is (And Isn’t) Using WordPress? As noted, the statistics we’re using are potentially not a completely representative sample, but within that sample, WordPress is by far the most used CMS platform. Although Drupal sites tend to have more traffic, WordPress is in line with most other CMS platforms on that front. Source: W3Techs. Retrieved 16th August 2015 (data may change over time). WordPress lags behind Drupal in high-traffic sites, though one could hypothesize that there could be a lot of high-traffic WordPress sites whose averages are pulled down by the sheer number of lower-traffic sites. However, as I discovered when I looked individually at the top 250 Alexa sites, only six used WordPress and only two of those used WordPress to power the whole website – those two, incidentally, were WordPress.com and WordPress.org. In terms of the highest ranked sites, the trend seems to be that media organizations were using WordPress (quite a common theme in some of the highest ranked sites anyway) to publish less formal content, often from contributors as opposed to the organizations’ editorial staff. The web is undoubtedly revolutionizing the media and these sorts of contributions are rapidly replacing full-paid editorial staff, not least because it’s much easier and cheaper to have subtly “sponsored” content. A prime example is The Guardian newspaper’s Comment is Free section which, although not WordPress, is a good example as one of the most-read online publications. The debate over whether this is a healthy state for traditional print media is one for another time, but this more “bloggy” content from large organizations is likely to make WordPress an increasingly viable option. However, the big players are far from everything, and WordPress’ huge share comes from the millions using the platform for their smaller sites. Even though it makes up ~0.00001% of W3Tech’s 24.2% figure, WordPress.com is a good indicator of what many other, smaller self-hosted sites are using WordPress for: creating pages on a website, often with blogs. Blogging is what WordPress started out for and while it has developed into a full CMS subsequently, this is what a big part of its use is still going to be about. Naturally, there are different interpretations of its blogging features – variously used for traditional blogging, press releases and organizational news – but in essence they’re doing the same thing. Clearly, for running relatively simple sites, WordPress ticks all the boxes with its core features: ease in picking and changing designs, blogging, page, easy image and file integration, security and friendly UX. Then, of course, there’s the cost advantage. What Else Could WordPress Do? Automattic has been going to a great deal of trouble to expand what WordPress can do, because one of the platform’s greatest strengths is obviously the range of extra features its plugins can add; from forums, to social networks, to eCommerce. The latter is especially important given that Automattic just bought the company behind WooCommerce for US$30,000,000. It’s significant because these are areas where WordPress isn’t used; platforms like Magento, specifically built for eCommerce, has 2.8% of the CMS market share (1.2% overall Web share), with nearly a quarter of a million users. This is one area where WordPress doesn’t control the market as much as it could, and it seems Automattic wants to remedy that. And who else isn’t using WordPress? Well, that 58% not using any measured CMS at all is quite a large audience to target. There are all sorts of different websites under the “no measured CMS” banner. Many will be using bespoke solutions, perhaps because they feel that WordPress can’t be flexible enough to cater to their individual site’s needs. It would seem logical that going forward, it’s going to gradually get more difficult to attract more users to the platform. This is because increasingly narrow features will need to be added to attract more difficult users, without undermining the simplicity of the systems its existing users enjoy. In saying that, the market segment that will obviously have to be tackled since it occupies more than half (even if some gains are made from other CMS platforms) is those websites not using tracked CMS (ie. including bespoke solutions). Reaching 50%: A Worthwhile Target? It’s worth asking if that 50% web share is a worthwhile target to pursue, in a number of senses. 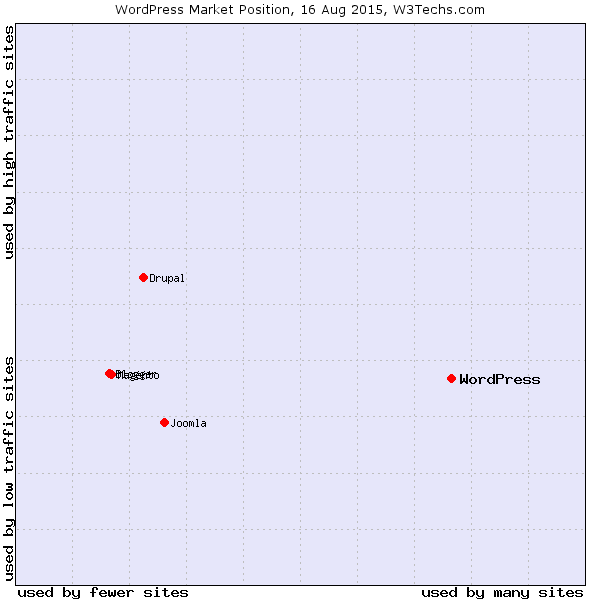 Firstly, WordPress and its most influential affiliates (i.e. Automattic) have made clear aims to “democratize publishing”. It could quite well be asked whether this big aim can obtained by achieving an even larger market dominance, potentially pushing out other innovation. Of course, everyone on the internet is free to use whichever platform they please, but aiming to move to what could become an oligopoly or even effective monopoly market could arguably stifle any innovation through new platforms. Many states will regulate, or at least monitor, this in most industries and it could be suggested that this 50% aim could be irresponsible – leading to a less desirable position than the market as a whole is currently in. Perhaps a more pertinent question is how achievable this particular target is; it’s arguably beyond pointless to have an unrealistic target, even putting aside questions about the consequences of such aims. While the number of people not using a CMS is decreasing and WordPress is filling the gap, plenty of websites with more custom features – such as eCommerce – will need a lot of convincing to move to WordPress. Many still feel that platforms designed specifically for their needs are better than WordPress with a plugin – and this might apply, for instance, to community sites too: would vBulletin users consider abandoning such a mature platform for bbPress? That’s not to say that it’s impossible to convert these users from other established platforms, or their bespoke solutions: WordPress just has to offer the best functionality as well as the obvious attraction of the cost savings it provides. Again, that’s not impossible, but it will require a lot of hard work, and potentially more marketing than has been required for the first quarter share. WordPress’ best advocates are its own users, so breaking through into these new areas – a charge apparently being led by Automattic – is going to require a steady stream of people converting. It seems then, that the 50% target may well be achievable with huge investment in plugins to develop new functionality and resources on top of a modern, future-ready core platform. Theseus’ paradox is often brought up with regard to the future of the WordPress platform. It’s a thought experiment that asks whether something with all its components changed is still the same thing. But actually, the future seems to lie not necessarily in what the Core platform becomes, other than essential modernization to make it completely fit for a mobile web. The success of the platform in breaking into new areas of the market, as Automattic seems to recognize in its huge investments in companies like WooThemes, is going to be adding the extra functionality with the quality people will need to be convinced that WordPress is better for their needs than the established providers’ services. The 24% share WordPress has right now isn’t determined by a flawless metric, as we’ve seen. Within the CMS marketplace, it has already surpassed the milestone of half the market share, and now it’s aiming to do that with the web as a whole. It will be up against it to break through into bespoke CMS and non-CMS users’ marketplace though, although it will be essential to tackle this if WordPress is to succeed in what it has set out to achieve. To do this, it’s going to need to be able to continue proving its worth as a modern platform, something it’s already able to do well, improving with every new version release. More importantly, it’s going to need to show that it’s better than the standalone platforms, by providing functionality through improved plugins. A big focus will obviously be on eCommerce, as more and more businesses take to the web with its growing number of users. While some questions still remain as to whether WordPress’ and Automattic’s plans are advisable, if it goes about it the right way there shouldn’t be too much doubt that WordPress will extend its influence across the web even more. With its growing support for many languages, there’s a good chance it will become internationally and widely-used for an even more diverse range of purposes. Do you think WordPress can hit 50% market share? What do you think of the direction the platform is heading? Let us know in the comments! very informative article, I think wordpress will go beyond 50% mark, its a big hit with designers and developers alike, it has a huge community and a tonnes of themes and plugins to extend functionality plus its really simple (clients love wordpress) so yes it will reach 50% in future. I believe the latest version of wordpress is 4.3 not 4.2 but anyway, 50% is an ambitious goal. Weebly and blogger users are also on the rise. Interesting point, but do hosted solutions really belong in the equation? It seems that Weebly is a single website and users are simply subdomains of the site. If only WordPress knows that using post_meta and wp_posts table will make everything inefficient. If WP has a plan to switch to custom DB, they can go a long way at dominating the web. As another example of media organizations using WP, many of Washington Post’s columns (even some written by its own editorial staff) use WP, although they also have a tech staff to make customizations. Many thanks! I wanted to know that. It’s vary helpful statistics. Yes! The most popular open source CMS WordPress has added a whopping number of 1,150,000 sites and it seems like the platform is going to break the threshold of 50% market share very soon. Keeping the size of internet in mind, 50% is big target, but the way WordPress is growing and adapting the need of most of the users, it does not seem impossible. I am very optimistic about this target and wish WordPress to achieve this target very soon. Thanks, a nice balanced article. Appreciate the thought and the solid research that has been put into this piece. Yes – 50% is possible – it is question of how long it will take to get there. The M&A route will play a big part of this future growth. Big budget advertising would contribute to the adoption rate. Interesting to see people like ken Evoy of SBI becoming more focused on WordPress. It will very interesting to see how WP has evolved by the time we hit the 50% mark. with lots of competing cms out there. 50% market share is a very ambitious goal indeed. It seems to me that the only way this is attainable is to take on the hosted solutions like Wix, Weebly, and SquareSpace which are growing fast. While I don’t really believe that these solutions figure into the equation because of their hosted nature, they still attract a lot of attention. As I stated earlier, they aren’t truly stand alone websites as much as extensions of the same site. Nonetheless they are still a force to be reckoned with because they attract the budget conscious DIY market. These solutions are intended to bypass the developer and WordPress doesn’t quite do that. The backend GUI is still technical enough to intimidate the less technically inclined user. Gaining a 50% market share in my opinion, would require a complete overhaul of the GUI to grab more of the DIY market. I’d love see some stats on current WordPress sites that are DIY vs. Developer created sites. With the layers of complexity and inconsistencies created by all the Plugins and Theme UIs, it will be hard to obtain acceptance from DIYers who are less technical. These users will turn to solutions like Weebly, Wix, Squarespace and Jimdo for their local businesses and startups websites. Even DIVI, which I love, own, and use, adds a lot of complexity for a non-techie that struggles to understand just how to make simple changes in a theme and then realizes that to change a color they need to know css or find a devleoper. For this reason, I think the 50% will be tough. WordPress needs to become a real CMS with actual user management, permissions systems and front-end user facing interfaces before it can even think of reaching 50% market share. They need to just bite the bullet and build a real CMS, and deal with the plugin ecosystem aftershocks. Core CMS functions should be core functions, not passed of as “oh, you can build a plugin for anything!”. I only work with WordPress because I am forced to by my employer. It is a nightmare every time. After repeatedly hearing about WP for bloggers (usually) from their own advertisements, I signed up as a first time blogger. I signed up for tutorials that went on forever. I’m a writer not a techie. After reading the article above, I now realize WP is not for an individual, average blogger. Had I known your goal was to catch and capture larger fish to corner a larger part of the market I wouldn’t have wasted my time trying to understand how WP operates. I don’t need the bells and whistles that make your system so complicated for single users. What you need is WordPress Lite for those of us who can set up their own website but can’t set up a blog on WordPress. E-commerce plugins that don’t make it easy to calculate/refund/attribute VAT in the country where the customer resides (for example as is now required in the EU) could prove a challenge for website owners. This came to light in a big way here in the UK at the end of last year as new rules had to be implemented this year – and has resulted in a lot of small businesses closing down as their websites simply couldn’t handle this & using digital 3rd parties (such as Clickbank and others that DO handle VAT correctly) was outside of their technical know-how – or they would lose too high a percentage of their sales to these platforms. Just thought this worth a mention as it’s complicated, and a lot more countries are wanting to introduce this – which could impact a lot of us! It is my experience that coder/programmers are generally just terrible at explaining what their code does to people who are NOT coder/programmers. It just is not in their genes. THAT opens the door to millions of non-technical users who can jump right in and use WordPress without getting overwhelmed. And, as WP grows, it is inevitable that it will become more overwhelming. (Which really begs for simplicity in the underlying system with Plugins adding this and that – so that the complexity grows by choice of plugin(s). And, by the way, those tutorials are your direct interface with your users. They are how you convey YOUR enthusiasm and excitement about your product(s). Nothing creates engagement better than great tutorials with voice over… Phooey on Facebook in that regard. Look at https://thrivethemes.com/landingpages/ to find a guy who does the best tutorials of them all You cannot miss his enthusiasm and ability to connect with his viewers. I say that THAT is engagement…!!! If you look at the top 10k e-commerce sites, WooCommerce powers 7% of them. If you look at “the entire internet”, WooCommerce actually powers 30% of all webshops.